The five pasture puffballs in the front row grew in Westborough. The one on the far right is the size of a softball. Behind them is a giant puffball at least 15 inches wide. You notice something round and white in the grass. Golf ball, softball, soccer ball, or puffball? Since it's autumn—the height of mushroom season— it might be a puffball. What's a puffball? Like a mushroom, a puffball is a kind of fungus. Also like a mushroom, for most of the year it grows unseen as threads in the ground or in decaying wood. When conditions are right for it to reproduce, its above-ground parts come up. The mushroom or puffball that we can see has the job of sending off millions of minute spores. That job is where the "puff" in "puffball" comes in. In the case of mushroom caps with gills, the tiny spores develop in the gills and eventually fall out. But in puffballs, the spores mature in a mass that makes up the inside of the round puffball. Puffballs are usually white and firm inside when they're young, but they become soft and darken or develop color inside as they age. 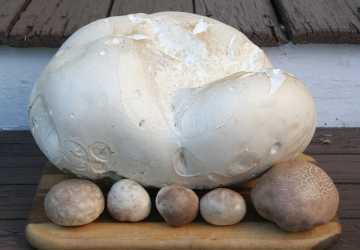 Eventually the outside covering of the puffball breaks down, forming a pore or cracks that allow the spores to escape. The name "puffball" comes from the smoky-looking puffs of spores that shoot out when an aging puffball is touched by an animal or insect, raindrops, wind, or even a human foot. You're likely to find puffballs in the autumn, especially a few days after a soaking rain. They grow in lawns, golf courses, athletic fields, and meadows, by the side of trails, and even in packed dirt parking lots. Like mushrooms, they sometimes come up in circles called fairy rings. Puffballs are more common than you might think, and once you know about them, you're more likely to spot them. Places in Westborough where puffballs have appeared include the grassy area along the Otis Street entrance to the Stop & Shop on Rte. 9, the Bowman Street Conservation Area parking lot, the sides of the trail from the Bowman Street parking lot to the picnic pavilion, and even some lawns and back yards downtown. Puffballs come in different kinds and various sizes. Pasture or vase puffballs (Calvatia cyathiformis) are often tan and can grow to the size of a softball. They are also called purple-spored puffballs because they turn dark purple inside at maturity. Look for them in grassy areas in Westborough. Skull-shaped puffballs (Calvatia craniformis) are also softball-sized but are shaped like skulls. They grow in open woods, often near oak. They become yellow-green or yellow-brown inside with age. Gem-studded puffballs (Lycoperdon perlatum) are usually golf-ball-sized and covered with small spines. They sometimes have a bit of stalk so they can be shaped somewhat like turbans. You can find them in open woods and along roads. Pear-shaped puffballs (Lycoperdon pyriforme) range from the size of marbles to the size of ping-pong balls. They live on decaying logs and stumps, often growing in clusters. They are pear-shaped and covered with tiny warts. Pigskin poison puffballs (Scleroderma citrinum) are yellow-brown or ochre in color and covered with warts. They are baseball-sized or smaller. You may see them in Westborough's woods and in sandy areas. Giant puffballs (Calvatia gigantea) are unmistakable because of their huge size. Some are as big as soccer balls. They can get to be 20 inches across. They're white when young but turn brown over time. Woods, pastures, and city parks are places to look for them. Would anyone eat a puffball? People who have the expertise and experience to gather their own wild mushrooms regard certain kinds of puffballs as edible in their early stages, while they are still pure white inside. Don't try this on your own! Some puffballs are poisonous, and even those that are considered edible can provoke a reaction in some people. There's also a danger of mistaking a young deadly Amanita mushroom for a young puffball. Pasture puffballs have also been used to stop bleeding, presumably as an external treatment.